Alteratives are herbs that gradually restore the proper function of the body and increase health and vitality. They seem to alter the body’s processes of metabolism so that tissues can best deal with a range of functions from nutrition to elimination. Many herbs with this action improve the body’s ability to eliminate waste through the kidneys, liver, lungs, or skin. Some stimulate digestion or are anti-microbial. Alteratives move the body to a state of health, removing indicators of systemic disintegration. They are often used for skin conditions to take some of the pressure of “detoxifying” the body and off of the skin while at the same time improving the skin’s ability to eliminate waste and heal. Alterative herbs are best used internally for their properties and can be particularly helpful for psoriasis, eczema, acne and many other skin conditions. Oregon grape root is a bitter herb with a cooling and drying effect on the body. In addition to assisting the eliminatory functions of the body, it also acts as an antibacterial, antifungal, and aperient (has a mild laxative effect). Oregon grape root bark contains berberine, an alkaloid also found in goldenseal— goldenseal and oregon grape root have many similar qualities. Bernstein et al. (2006) conducted a clinical trial on a proprietary blend of Oregon grape root and found it to be effective and well tolerated in patients with mild to moderate psoriasis. Oregon grape root is also commonly used for acne and eczema. Oregon grape root is contraindicated in pregnancy and should be used with caution if breastfeeding. Red clover blossoms are common in farm fields all over the U.S. and are known for their lymphatic, anti-cancer, expectorant, and anti-catarrhal properties. Particularly useful for eczema and psoriasis, red clover is best taken as a tea because it is loaded with minerals. Red clover contains iron, potassium, magnesium, calcium, and manganese. It is also high in protein. Red clover is a very safe remedy, though if fermented can affect the coagulability of the blood. Stop using red clover 2 weeks before a scheduled surgery. Stinging nettle leaves have a salty/minerally taste and a drying effect on the body. Like red clover, nettle is a mineral-rich alterative, containing calcium, magnesium, iron, potassium, silica, selenium, and zinc. Nettle also has a diuretic effect but spares potassium, unlike many pharmaceutical diuretics. Nettle’s anti-inflammatory and astringent properties make it not only helpful for the skin, but also for allergies and hyper-reactive conditions. Taken internally, nettle can be helpful for acne, eczema, and other skin rashes. Don’t let nettle’s stinging nature scare you away from harvesting this useful plant! Just grab a pair of gloves and cut the new growth of the nettle plant into your harvesting basket. Dry young leaves for tea or try using fresh leaves in place of spinach in any recipe. Digestive problems are also linked to skin flare-ups. So If your gut is out of balance because it doesn’t have enough “good bacteria”, or lacks sufficient stomach acid, digestive enzymes, or carries too much candida fungus, the imbalance will be reflected in breakouts onto your skin. Burdock root works on gastrointestinal health and regularity. So from acne to eczema to psoriasis, burdock root is known to calm and heal these common skin issues. Consumption of burdock has also helped many people with skin issues through its blood-cleansing and internal cooling abilities detoxifying the body, and so helping to reduce flare-ups. Steep these roots in boiling water to make a daily detox tea. Dose: Steep Half to 1tsp root to each cup and drink 3x/day, Tincture 1:5, 25%, 8-12ml 3x/day. Many skin conditions arise from inflammation, whether from within the body or from an external source. Inflammatory skin conditions include acne, eczema, contact dermatitis, and anything that is warm/burning and/or red. Below are several anti-inflammatory herbs with an affinity for the skin. There are many more anti-inflammatory herbs such as: aloe, liquorice, St. John’s wort, plantain, rosemary, comfrey, lavender, violet, chickweed, and marshmallow. 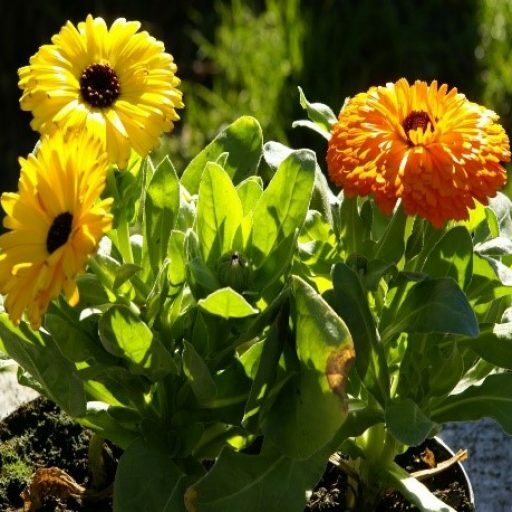 Calendula is an easy herb to start from seed in the garden and it can be quite prolific—producing flower after flower all summer long. Flowers can be continually harvested as they come into bloom and dried for tea or made into tincture or infused oil. Calendula promotes the growth and healing of epithelial tissue. It is not only anti-inflammatory but also antimicrobial, reducing the possibility of infection from a cyst or wound. Calendula can be used internally and externally for wounds, inflammatory skin conditions, boils, burns, and bruises. Try rinsing or compressing the affected area with a strong infusion of calendula or making an oil, salve, or cream with a calendula base for burns, bruises, or inflamed areas of the skin. Safety: Not to be taken internally in pregnancy. Chamomile is a great external and internal remedy for skin or gut inflammation. Try using a strong infusion of chamomile tea as a face wash for acne, or taking a chamomile bath for inflammatory conditions that are more widespread. Chamomile flowers can also be made into a poultice for smaller areas of skin inflammation. Meadowsweet blooms from around June through August with beautiful, fragrant white flowers. 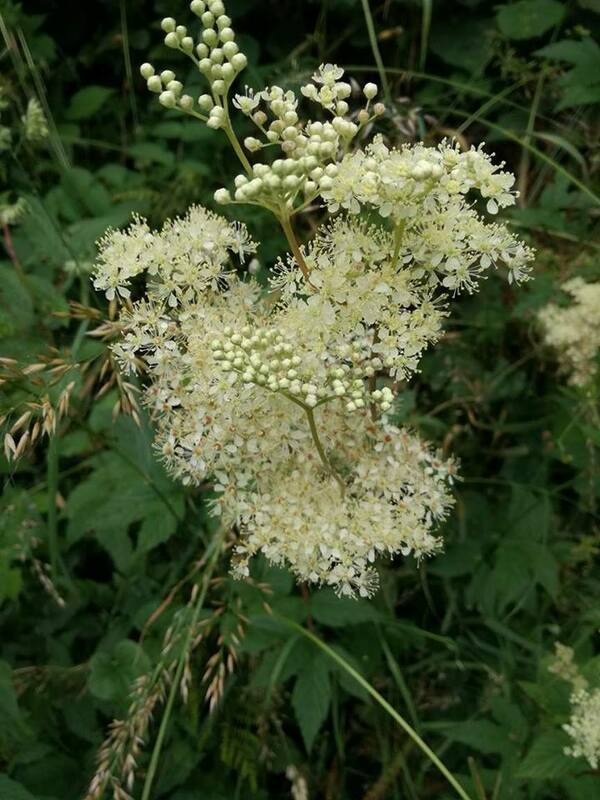 These flowers, along with the leaves of meadowsweet, are used as a cooling and drying anti-inflammatory remedy especially useful for acne. Try using a strong meadowsweet infusion as a face wash or mist. In addition to its anti-inflammatory effects, meadowsweet is also used as an analgesic, alterative, antibacterial, astringent, and diaphoretic. Meadowsweet is commonly used for digestive disorders, especially with heartburn or gastric ulcers. In a recently published article in the journal Phytotherapy Research, Drummond et al. (2013) demonstrated a significant anti-inflammatory affect in chamomile and meadowsweet, as well as willow bark. Antimicrobial herbs (those that have a broad-spectrum activity against tiny creatures like bacteria, fungi, and viruses) are useful for infective skin conditions including acne, herpes, athlete’s foot, yeast infections, etc. Below are detailed descriptions of a few herbal antimicrobial's. Others include calendula, chamomile, meadowsweet, thyme, sage, St. John’s wort, and goldenseal. Rosemary has long been used as an antimicrobial agent in the kitchen to keep food from spoiling. Recent research indicates that it also suppresses the activity of common acne-causing bacteria (Tsai et al., 2013). Another study found antimicrobial effects of rosemary that suggests its usefulness in certain types of eczema (Weckesser et al., 2007). Rosemary has also been found to have a photoprotective effect against UV-radiation (Martin et al., 2008)! Use a strong infusion of rosemary as a face-wash for infective acne or try some rosemary essential oil in your moisturiser. For eczema, rosemary essential oil or tea can be used to make a soothing cream. Lavender is commonly used in skin preparations for its antimicrobial, vulnerary, and anti-inflammatory properties. Try a topical application of a strong lavender infusion for acne, eczema, or psoriasis. 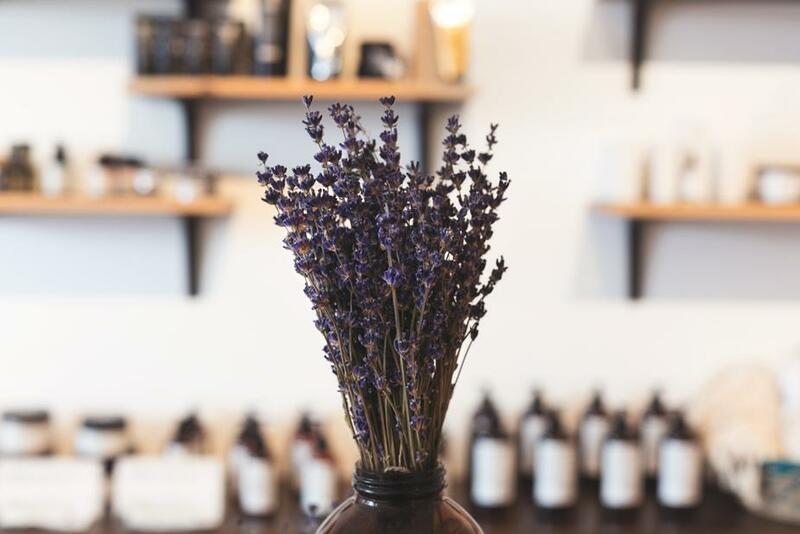 Lavender essential oil can be used on its own or with a carrier oil for burns, eczema, psoriasis, acne, bruises, sprains, and to minimise scar formation. Yarrow’s genus name comes from the Greek warrior, Achilles. Achilles’ mother bathed him in a bath of yarrow to keep him protected but was holding on to his heel while she dunked him in! And so, Achilles’ heel didn’t get the magical protection of yarrow. Yarrow not only offers energetic protection but also protects us from bacteria, fungus, blood loss, and inflammation. One of the best remedies for wounds, yarrow promotes the growth of new healthy tissue while protecting against infection and preventing blood loss. Safety: Yarrow is contraindicated during pregnancy due to its high volatile oil content.